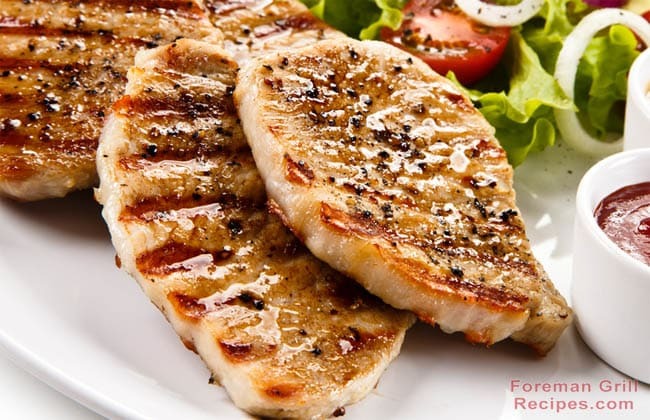 Apple Balsamic Grilled Boneless Skinless Chicken Breast is a dish that you’ll love and make again and again. Choose an apple variety to your liking – sweet apples such as honey crisp are amazing! The sweetness of the apples mixed with the balsamic vinegar, onion and rosemary will make the chicken breast a delicious, sweet and savory meal. Saute apple and onion in pan with the olive oil for 5 minutes or until softened. Pour in chicken stock, add rosemary and balsamic vinegar and bring to boil. Reduce heat and simmer (8 minutes) until liquid reduces down to a sauce like texture. Layout chicken breasts on a plastic wrap covered solid surface and pound to even thickness with a meat mallet (aprox 1/2 – 3/4 inch). Preheat your Foreman Grill for about 5 minutes. Brush chicken lightly with olive oil and add salt/pepper to taste. Grill meat for 3-6 minutes until juices run clear and internal temp of 165 degrees. Remove from grill and let sit for 5 minutes. Pour sauce over chicken and serve immediately.